"More than anything, most of the demonstrators want to see an end to corruption." My definition: Corruption is the psychotic symptom of excessive violence. I love love love articles like this where I find something out and the author seems to tell the TRUTH about something I long to know about. 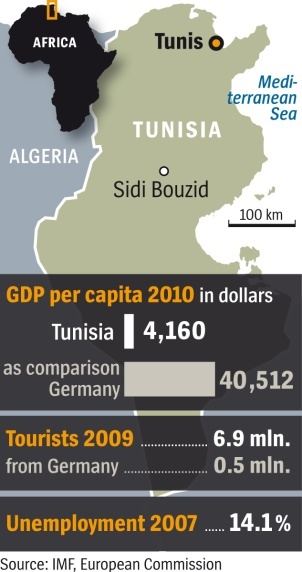 This shows some of what may happen in a NEW Tunisia. I am also going to check IC Publications Africa Today and The Middle East to see what they are saying. Obviously some leadership is emerging, if only in the media's imagination. Notice I already had a Middle East liberation tag. I just KNEW this had to happen eventually. Even the totally screwed over by being terrorized get fed up when they are told they won't be able to eat, but the Fat Cats are eating caviar in Dubai. Tunisians are intoxicated by their newfound freedom. The media is publishing long-suppressed sentiments, while activists form new parties and young people hold heated debates on street corners. But the country is facing huge challenges in its bid to become a modern democracy, and it will hardly be possible to stick to the deadline for new elections. The 18 men and women have formed a circle, with some sitting and others standing. They are holding one of the first editorial meetings ever convened at La Presse, a daily newspaper in the Tunisian capital Tunis. They discuss thetremendous things happening in their county and what should appear in tomorrow's paper. They are intoxicated with newfound energy. Now they want to do all the things they have never done before. They want to tell the stories that will stir the country, stories about the little bookshop around the corner displaying formerly banned books, about how stores are gradually reopening their doors but food shortages continue, and about how people on the street are criticizing the new government. All of that is supposed to appear in the next day's edition. They also want to write articles about the social networking Internet platform Facebook, which has become an alternative source of news for the country's youth. They are even considering downloading and printing images circulating online of police violence and destruction from all over the country. Still, they are not completely sure how far they should allow themselves to go. They debate and argue over whether they should criticize individual ministers who are particularly incompetent and whether they should identify all the authors of opinion pieces by name. Faouzia Mezzi is leading the meeting. While the autocratic former President Zine El Abidine Ben Ali still ruled the country, there were times when she was banned from writing articles. Today, she is having a hard time restraining those staff members who would prefer to change everything immediately. "We first need to see if we can even publish a newspaper at all," she says. "Be patient." At the time, it had only been five days since Ben Ali, Tunisia's dictator for 23 years, fled the country, and only the fifth day that the country had enjoyed freedom of the press. No one gave it to these journalists; they simply took it. While the country was rising up against the regime, they launched their own revolution. But there appear to be limits to the new freedom. The interim government shut down the country's most popular private television station, Hannibal TV, on Sunday night. The New York Times, quoting Tunisia's state news agency, reported that the government had arrested the station's owner, which it accused of treason for broadcasting "false information likely to create a constitutional vacuum and destabilize the country." A spokesman for the station, which had criticized Ben Ali's government in the past, said that it had been shut down without warning and called the move a violation of freedom of the press. By Monday morning, however, the station had resumed broadcasting, apparently after an opposition member of the interim government intervened. Observers in Tunisia told the New York Times that the network's shutdown damaged the interim government's credibility and said that the fate of the station would be seen as a test of the state's commitment to press freedom. La Presse, which appears in both French and Arabic versions, is one of the country's oldest newspapers. Like almost all media sources in Tunisia, it is government-owned, meaning the state appoints its senior editors. During the dictatorship, those editors would dictate the issues to be covered, as well as censor anything that could upset the regime. Naturally, the journalists also practiced self-censorship. Indeed, until the revolution, La Presse was little more than a bland mouthpiece for government statements. On Friday, January 14, 2011, even before Ben Ali and his family had been chased out of the country, the paper's staff allowed itself to be infected by the same lust for freedom that had gripped the entire country. They stripped the editor in chief of power and designated a group of 10 people to be in charge of managing the paper. The former editor in chief still has his office with its leather chair and he can be spotted skulking along the corridor, but he no longer has any say. The journalists formerly under his charge have been busy discovering what it means to live in a free society -- just like people throughout Tunisia these days. Back at the meeting, Olfa Belhassine from the paper's culture section proposes an editorial entitled "Who's Afraid of Press Freedom?" She adds that, in her 20 years of working in the media, she has always dreamed of writing just such an article. The next day, it appears in the paper.